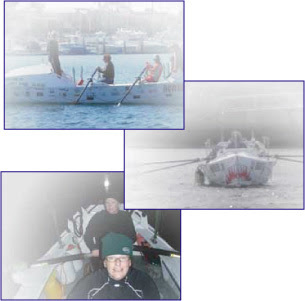 Over $650.00 in prizes to help a Trans-Atlantic rowing team name their boat. The first prize is a package worth over $500 and there are 5 additional prizes! This is not just any boat you're helping to name - it is a boat that will be rowed in the 2009 Woodvale Challenge Atlantic Rowing Race from La Gomera, Canary Islands to Antigua, West Indies (approximately 2,900 nautical miles across the Atlantic Ocean). This is currently the only American team signed up for the race, and is one of the few comprised of all women rowers, including Anne Miltenberger, Kelly Nothstein, and Lauren Greenspon, who plan on making history by breaking the world speed record for their crossing, while trying to bring attention to the environment by supporting Keep America Beautiful. Please help them name their boat! Ask the Boater is co-sponsoring this contest with Custom Boat Names, and it is very easy to enter. Simply click here to enter your one suggestion for a boat name in our entry form. Be sure to complete your entry soon - contest ends March 31, 2009! Thanks for all the great entries - your boat names were all wonderful, mostly. The contest has ended and the rowing team is selecting their favorite name. Stay tuned!